Name: Timothy John-Luke Smith, PSA. Bio: Timothy John-Luke Smith was born in 1966 in Teaneck, New Jersey. Timothy studied in the classical tradition of drawing and painting from the age of 15 and was accepted into the High School of Art & Design in New York City where he studied with Irwin Greenberg and Max Ginsberg. After graduation with a Regents Art Diploma, in June of 1985, he took art history classes at Long Island University, Southampton, NY. During this year he found the work of the French Neo-Classicists and the French Academic schools to be the guiding lights for his technical study of painting and drawing. Next September he began studying at the Art Students' League under George Passantino and at the National Academy School of Fine Arts under Harvey Dinnerstein and Ron Sherr. Soon after, he received a full-tuition scholarship at the Academy. Harvey taught him pastels as a painting medium and they were immediately embraced by Timothy. His favorite artists are still the oil painters of the Neo-Classical and French Academic schools and his pastel paintings have the look and feel of an oil painting. Timothy painted his pastels in a self-prepared wooden support – see his videos for an understanding of his technique. Timothy was elected Signature Member of the Pastel Society of America in 2006. Style: Realistic treatment of subject. Navigation: Website is available in English and in Spanish. The main menu stays on all pages except on the Resume page, where you must use the PC’s back button to return to the previous page. Image View: There are two pages of thumbnails (a third is promised but doesn’t exist) under the Paintings link. Images enlarge on a new page with details of support, medium, dimension and artist’s comments. Use the right click option to open these images. They may be saved. File sizes are very large. Currency #2 is 2421x1507, 318 KB. 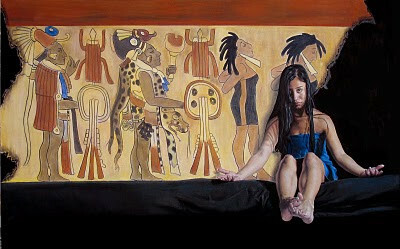 The original, painted on wood, is 24x36 ins. Demo: Videos page has 13 videos that are posted on YouTube, starting with the Underpainting for a Pastel Painting. Blog: Yes, but no entries since 2008.